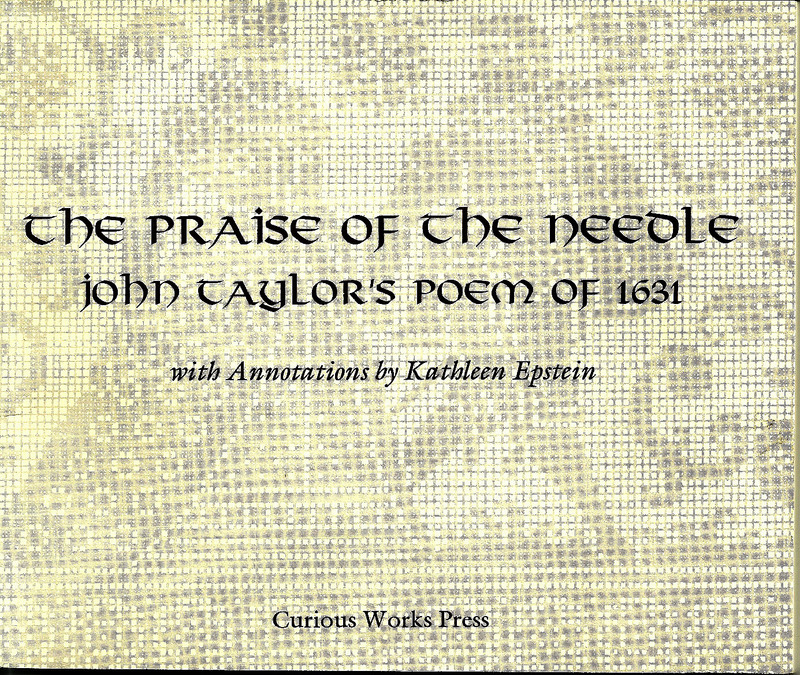 “The Praise of the Needle” is one of a series of “praise “poems written by John Taylor in 1693. 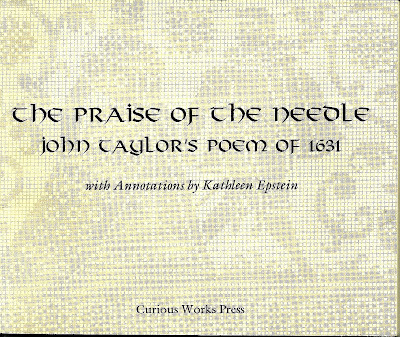 Somewhat humorous in tone he emphasizes the importance of needlework as a skill in 17thC England. Their linen-woolen fleeces yeare by yeare;….. So long at least, the Needles use shall last." Early man in northern climates relied on animal skins for warmth. Excavations of early cave dwellers indicate that animal pelts were “sewn” together for clothing. Actually, the skins were pierced by sharp bones, shells or horn and then laced together. 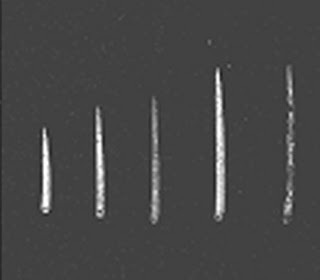 These early needles did not have eyes, although some had hooks, which were useful in lacing. The bronze age yielded silver, tin, lead and gold. Once the process of making iron was known, the ordinary woman could have iron needles, which also had no eyes ( a closed hook carried the thread). 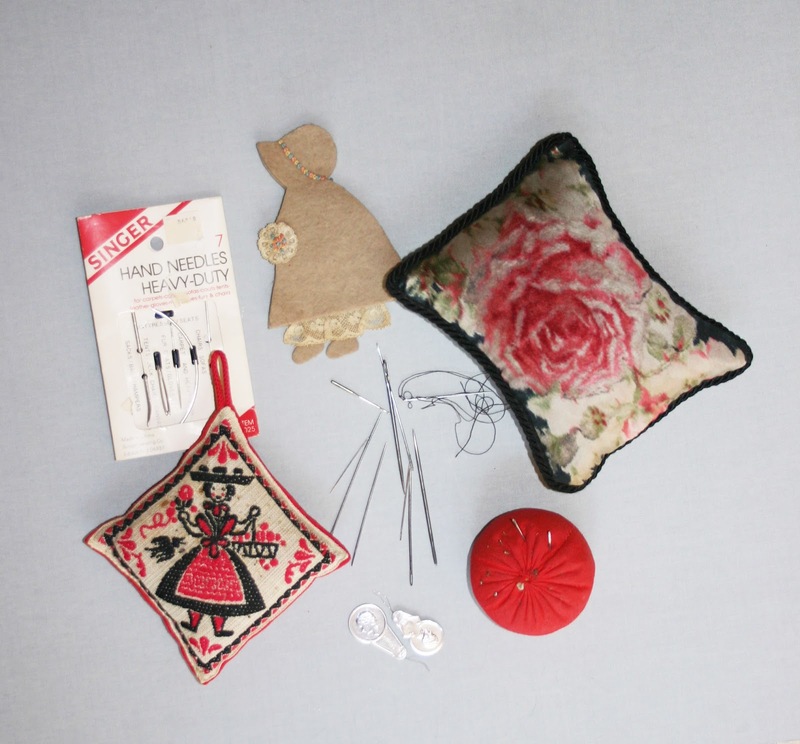 Throughout textile history the needle has not significantly changed its shape. The first fine metal needles are said to have been created by the Chinese for their elaborate silk embroideries, which along with the silk cloth were considered very desirable trade items. Iron needles were all hand-made until the 19th C and there are accounts of German needle-making centers that supplied England and Europe. In 1563 England passed an importation act that included banning the importation of needles and manufacturing centers grew in England. One town famous for its needle-making is Redditch. Iron was replaced by steel for needles as iron needles could only be hammered to a certain strength. An article in the 1843 edition of The Penny Magazine describes the steps in the hand-making process. Bundles of wires, 3 inches in length, were pointed on each end, the center was flattened and the eyes were punched, The needle ‘”twins” were halved and sent to be cleaned and polished. There was great health issues associated with hand-manufacturing as the grinders that polished the eyes and points of the needles inhaled much of the particles of the steel as well as the stone dust of the polishing wheels. Also, much of the sorting and polishing was done by children. The needles were sorted by size and separated into piles called “companies”. 14 pounds of wire could yield more than 48,000 needles, which were packaged for sale. In 1861 Redditch and nearby villages made 520 tons on needles. In time machines provided the labor. In 1826 a stamping machine was used to create the eyes and by the late 1880’s machines did all the work. Today needles are made from steel wire, which is cut, heated and straightened and pointed and then fed into a die to create the eyes. Finally, as in times before the double needles are separated, polished, tempered and sorted. 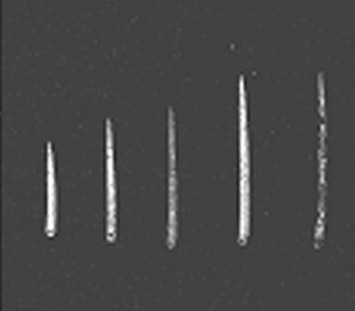 Various sized needles, including a curved and large upholstery needle, needle threaders. Victorian velvet pin and needle cushion filled with emery to keep pins and needles sharp and a needle book of felt with embroidery in the shape of a small girl. Once needles were manufactures in great quantities, thought was given to packaging. Packages and boxes of English needles had a portrait of Queen Victoria for many years and are now becoming quite collectible. At the turn of the 20th C lithographed illustrations were featured on needle packs. Other collectibles are needle cases and needle books. As needles were once quite expensive sewers were concerned for their storage. Cases of mother-of-pearl, ivory, and enamel were popular, some lined with silver or gold. Brass needle cases were especially popular. Collectors today label brass needle cases as "Averys" after one leading 19thC needle-maker, although there were several large manufacturers , all making brass cases as well. The cases were so elaborate and popular that they were patented More information on brass needle cases can be found in Victorian Brass Needlecases by Horowitz and Mann. Today cases can be found made of various materials. I have many wooden needle cases in which I keep various types and lengths of needles. Speaking of needles, where is the eye in a sewing machine needle? Why, at the point! This adaptation made the interlocking stitch made by the machine possible. An everyday thing we don't think of, but needles are so important! Thank you fot this nice, clear explanation.